This article is about character Kong Fu. For the Donkey Kong Country animated series episode of the same name, see Kong Fu. Kong Fu is a Kong and a relatively minor character from the Donkey Kong Country animated series. He was voiced by Len Carlson. Kong Fu's first and only appearance was in the episode "Kong Fu". Here he was hired by King K. Rool and the lizards to beat Donkey Kong in the annual Donkey Kong Challenge – a contest to see if anyone could defeat Donkey Kong in three challenges and become the new ruler of Kongo Bongo Island. Though Kong Fu managed to beat Donkey Kong in the Mind challenge, Kong Fu lost the Heart challenge to Donkey Kong; it seems Kong Fu was afraid of the dark and while Kong Fu was panicking during a solar eclipse Donkey Kong refused to hit him, showing true virtue and winning the Annual Donkey Kong Challenge. 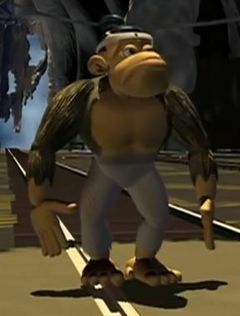 Despite dominating DK in the Body challenge, Kong Fu later forfeited the contest to Donkey Kong after he heard K. Rool, Krusha and Klump mocking his fear of the dark and calling him a wuss. Karate Kong from Donkey Kong Jungle Beat shares his French name with this Kong. Kong Fu bears a resemblance to Bluster Kong. Kong Fu is the only character that appeared exclusively in one episode (not counting the flashbacks in Message in a Bottle Show). This page was last edited on September 1, 2018, at 09:12.